Solange Piaget Knowles (born June 24, 1986), who performs under the mononym Solange, is an American recording artist, actress and model. Knowles was born and raised in Houston, Texas along with her older sister singer Beyoncé, a former member of R&B group Destiny's Child. Showing an interest in music recording at an early age, she eventually broke into the music scene at 16. 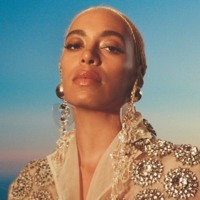 She has released two studios albums: Solo Star in 2003 and Sol-Angel and the Hadley St. Dreams in 2008, which peak at number nine in the US Billboard 200 chart. Aside from recording, Knowles has ventured into film, modeling, and entrepreneurship. She co-launched the junior apparel collection Deréon, a sister line to House of Deréon that was established by her mother and sister. Knowles has been compared to her sister by the media, but she dismisses the notion, saying they are artistically different.